Country fans, get excited!! The nation’s favorite duo have announced a special 5-date residency at Zappos Theater at Planet Hollywood! 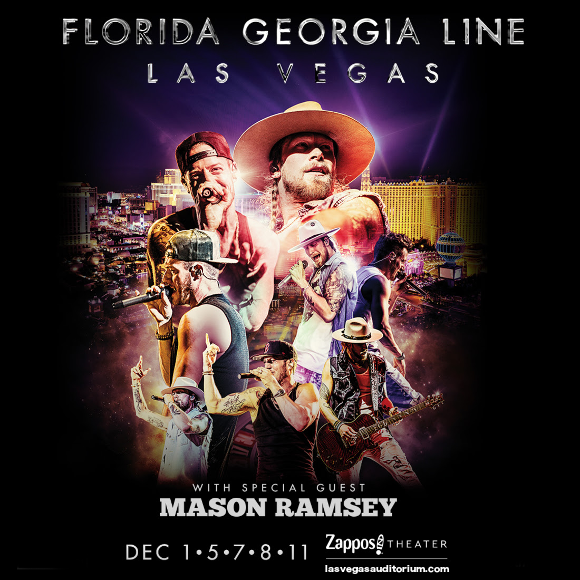 That’s right, FLORIDA GEORGIA LINE are coming to Las Vegas, kicking their first night off with a bang on Saturday 1st December 2018!! Treat yourself to an epic show this weekend that you’ll never forget – get your tickets NOW while they last!! Formed of singers Tyler Hubbard and Brian Kelley, Florida Georgia Line first emerged big on the country music scene in 2012 with their smash hit debut single “Cruise,” which has since become the best-selling country song of all time! From then on, their success has been on a steady upward trajectory, with sold-out tours around the world and multiple best-selling albums and singles. The band themselves are hugely excited about their success and the opportunity to perform in front of so many fans. Join in the excitement – have you got your tickets yet? ?